I've been looking for these Nabisco Chocolate Wafers for what feels like a long time, to no avail. Now that it's the holiday season, though, they all of a sudden show up on the shelves of every grocery store I go to. Odd, but good. 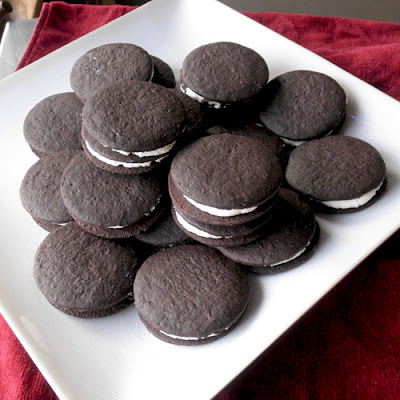 The reason I've been looking for them is because I've wanted to make this simple dessert that was brought to my school for us teachers one parent-teacher conference night a few years ago. All this parent did was put dollops of sweetened whipped cream between Nabisco Chocolate Wafers. There were three wafers and two layers of whipped cream in these things. The lovely thing about them, aside from the deep chocolate flavor contrasted with the light creaminess of the whipped cream, was that the wafers were not crisp at all, but soft, like an ice cream sandwich. So, it was like eating a small, light ice cream sandwich. Mmmmm. Of course, I can't leave well enough alone, so my first batch of these babies have been made with the mascarpone frosting I've used in my whoopie pies and my chocolate birthday cake. Oh my goodness. Just as delicious as I'd anticipated. 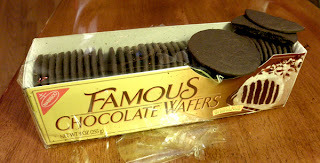 Thick sweet creaminess from the mascarpone frosting, and tender chocolate flavor from the wafers. This dessert is so easy and so quick. I'll be doing this again. In a mixer bowl, cream mascarpone, vanilla extract & sugar. Add cream and whip on high until stiff. Scoop frosting into a sturdy zip-top bag. Snip off 1/2 inch from one corner. Evenly squeeze about 1 1/2 to 2 tablespoons frosting on the bottom of a wafer and then gently top with another wafer. Repeat until you've used all the wafers.